I've been used to come across what looks like a genuine brotherhood mindset among the vintners I'm usually covering with my stories, they're often helping each other, they share their individual experience in their winemaking ways and occasionally do some hard work for each other. But when I heard about this initiative organized to help and support Nathalie, I was moved by the idea of all these wine people leaving their daily tasks and converging toward Marçon in the little-known Loir wine region (a sub region of the Loire known for its Chenin and Pineau d'Aunis) for this solidarity harvest. After the passing away of her husband Christian Chaussard in a tractor accident recently, Nathalie had to face the sudden charge of running overnight the family winery in addition to this heavy loss, and even though she's a trained enologist herself, her friends felt they could help and make her feel she was not alone. On this bright sunny day of october, all these friends walked together to the Pineau-d'Aunis plot cherished by Christian Chaussard, a couple-hundred meters behind the winery. They did the job for Chau-Chau (as Christian Chaussard was nicknamed by his tribe) and Nathalie, bringing their own bucket and shears. The grapes had suffered from the unusual combination of problems that occured in 2012, there were rotten grapes here and there and lots of sorting to do, but we all know that difficult circumstances yields often nice results. It was moving to see all these vintners, who represent some of the best the Loire region can offer, share the picking work and chat all along. They kept giving tips to each other on different issues related to vineyard management and winemaking all the while picking and sorting on the spot the damaged or rotten grapes, 2012 was indeed an arduous year here in the Loire, and particularly for them who farm organic. These guys were still joyful and they looked sometimes unruly like teenagers. There were more than 40 vintners/pickers here, sorry for the ones I missed. I'll post in a few days a few pictures about the warmful gathering of all these vignerons at the chai in the following afternoon. Thanks to the vintners for doing this. Sympathy to Nathalie. And thanks to you, Bertrand, for yet another reason to drink good French wine from small producers. thank you so much for sharing these moments - lets keep on drinking domaine du briseau now, it is the less we can do! I'd like so much to visit the Loire Valley vineyards. I'm from NYC and have been traveling in the EU for over a month now. My flight home was canceled due to weather and I'm held up here in Paris until Nov 13th. I don't speak french and do not have an international drivers license. I'm also kinda broke, as this trip has already cost me more than I budgeted. But, I HAVE to visit The Loire and would love to have an opportunity to see some cellars. I am currently in the works to open a retail wine shop in Brooklyn NY and have many years experience as a taster. A took courses at schools in NY including International Wine Center. 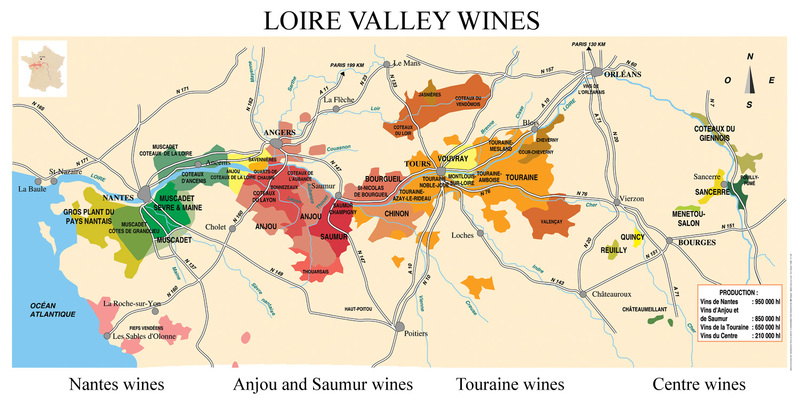 The wines of Loire are among my favorite in the world and I'm SO CLOSE! Any suggestions on my best options for next week, Nov 5-12 would be greatly appreciated- THANKS!